Both brown rice and quinoa are nutritious, natural foods that are simple to prepare and offer a host of potential health benefits. Although brown rice is the more ubiquitous choice, most major health and natural food stores offer quinoa in both packaged and bulk varieties as well. If you’re trying to make a choice between the two, it’s helpful to look at how they stack up against each other nutritionally and in taste and texture. According to the USDA, 1 cup of cooked brown rice has about 215 calories, 5 grams of protein, 1.75 grams of fat, 45 grams of carbohydrates, 3.5 grams of fiber and 1 gram of natural sugar. A cup of cooked quinoa has 220 calories, 8 grams of protein, 3.5 grams of fat, 39.5 grams of carbohydrates and 5 grams of fiber. Although quinoa is slightly higher in fat, it edges out brown rice in both amounts of protein and dietary fiber per serving. As a seed rather than a whole grain, “The New York Times” notes that quinoa has all essential amino acids in it, whereas the whole grain brown rice does not make up a complete protein on its own. 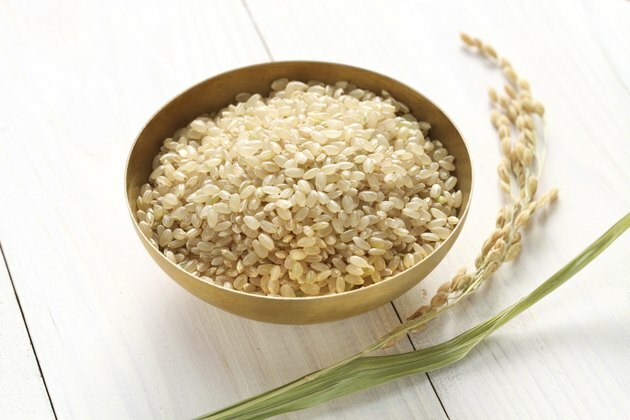 Cooked brown rice is just a bit darker than white rice, and it has a nuttier, chewier texture and more of a “bite.” The bran and germ have not been removed from the rice, so it can take longer to eat and digest. Quinoa is also somewhat chewy, but it has a softer texture and more of a neutral flavor. As far as preparation time goes, quinoa emerges as a clear winner. Brown rice typically needs to cook over low heat for about 45 minutes before it’s ready to eat, but quinoa needs only to be rinsed and cooked for 15 to 20 minutes before it softens. Brown rice and quinoa can be used interchangeably in nearly any recipe, since they have similar textures and flavors. Both work well in casserole, pilaf, as a plain side dish or even as the base of a breakfast porridge with milk and fresh fruit. Neither brown rice nor quinoa is a shabby choice nutritionally, and so it’s healthful to include both in your diet. However, if your protein needs are high or you’re a vegetarian or vegan and can’t get protein from meat products, it may benefit you more to eat quinoa since it does provide a complete protein on its own without a hefty amount of fat, calories, sodium or cholesterol. Is Quinoa Good For Digestion?